A robot under development at the University of Illinois automates the labor-intensive process of crop phenotyping, enabling scientists to scan crops and match genetic data with the highest-yielding plants. 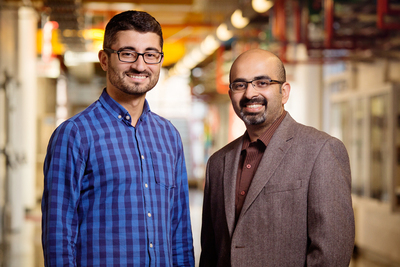 Agricultural and biological engineering professor Girish Chowdhary, right, is working on the $3.1 million project, along with postdoctoral researcher Erkan Kayacan. CHAMPAIGN, Ill. — A semiautonomous robot may soon be roaming agricultural fields gathering and transmitting real-time data about the growth and development of crops, information that crop breeders – and eventually farmers – can use to identify the genetic traits in plants likely to produce the greatest yields. Although the researchers currently are using the robot to assess fields of energy sorghum, a crop used in biofuel production, they say the robot would perform equally well with other tall-growing row crops such as corn and wheat, and possibly with soybeans before the plant canopy closes. The robot project is funded with a $3.1 million grant from the Advanced Research Projects Agency-Energy’s Transportation Energy Resources from Renewable Agriculture program, a unit within the U.S. Dept. of Energy. The TERRA-Mobile Energy-crop Phenotyping Platform robot is among the innovative energy technologies being showcased at the ARPA-E Energy Innovation Summit, being held Feb. 27-March 1 in Washington, D.C.